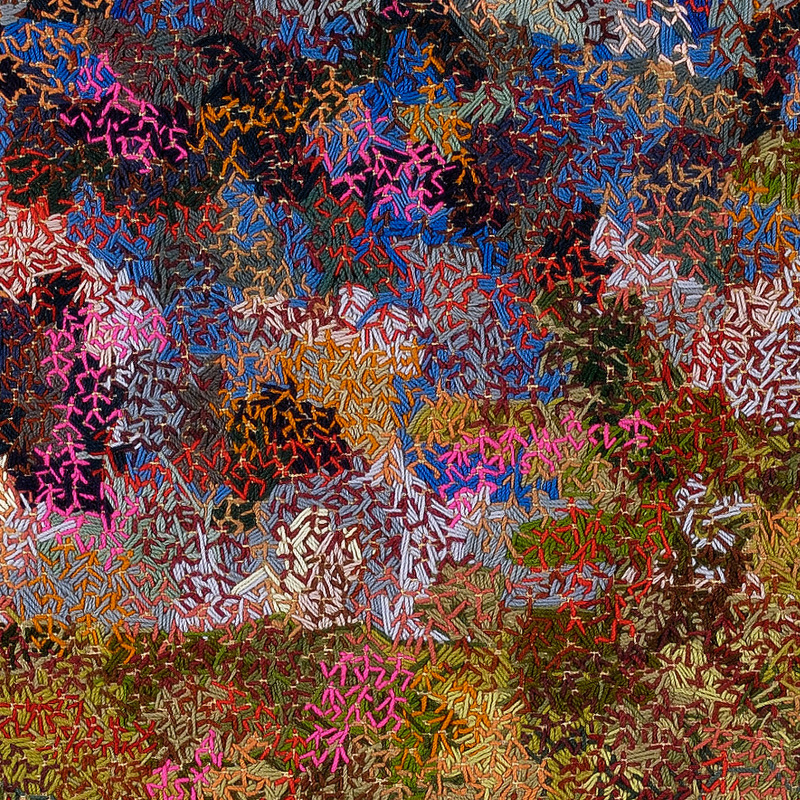 Art Projects International is pleased to present Here to There: Textile Drawings, a solo exhibition of eight large textile works by Portuguese artist Filipe Rocha da Silva on view from November 1 to December 15, 2018. 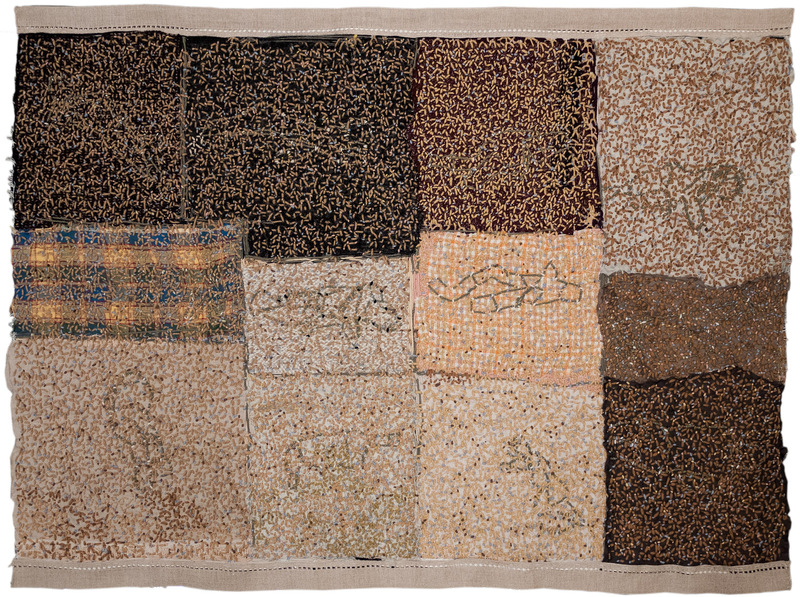 This exhibition is the artist’s first major solo exhibition in the United States and includes two of his most recent textile works making their public debut. An opening reception will take place on Thursday, November 1, 2018, 6-8pm, at 434 Greenwich Street in Tribeca, New York City. The artist will be in attendance at the opening reception. A special walk-through with the artist will be held on Saturday, November 3 at 3pm. Trained as a painter, Filipe Rocha da Silva has long been fascinated with patterns and draws thousands of tiny figures in rendered expanses. In his earlier paintings and drawings, the figures are simultaneously human and calligraphic markings standing in for the human. From a distance, the forms in the works solidify into modernist shapes — a stylized mound, a grid of colors — or figurative landscapes. 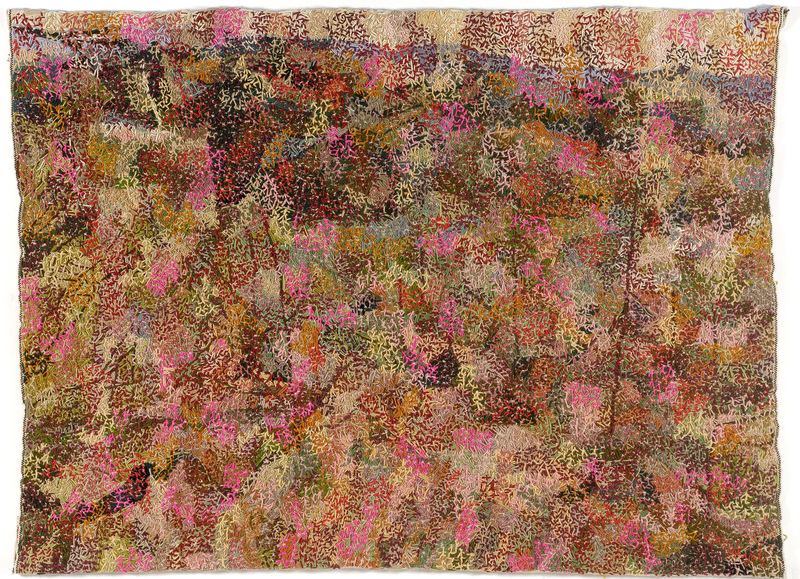 Since 2013, it is his labor-intensive “textile drawings” that depict similar patterns using solely the precise lines of wool thread borrowed from Arraiolos weaving. 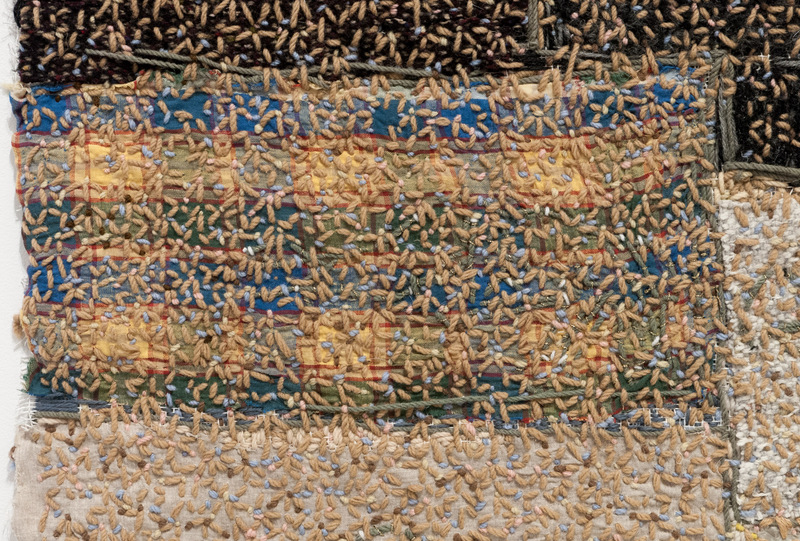 By using this specific technique, based on traditional secular weaving crafts common in Portugal, his new textile work blurs the conventional divisions between craft and fine art, and resists fixed boundaries. 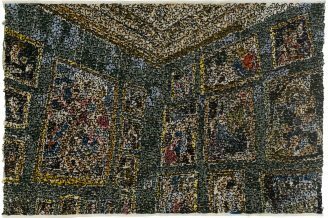 And by utilizing sewing and embroidery, time-consuming handmade practices not typically associated with male artists, his textile work prompts viewers to reconsider gender roles in art making. 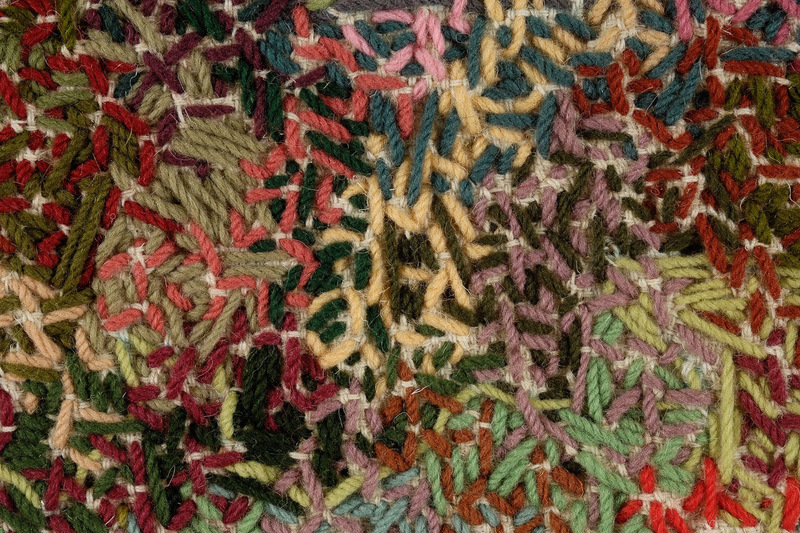 In the textile works on view, the extremely small figures that populate his work have now become embroidered stitches. 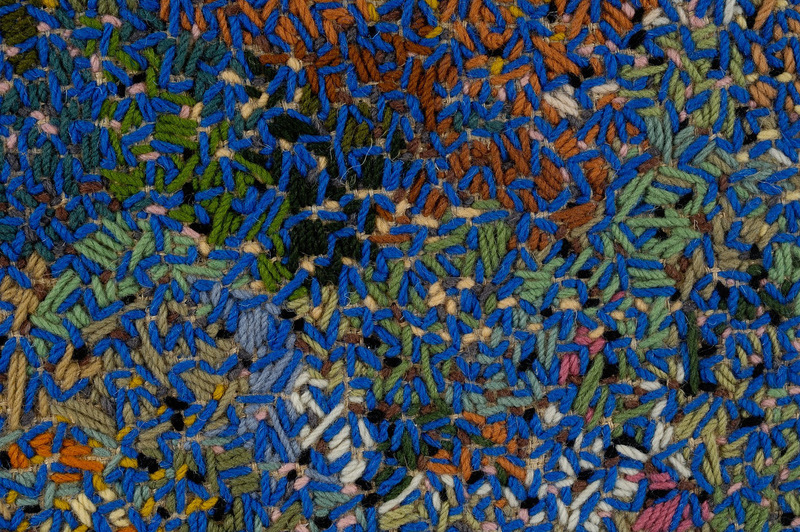 Instead of repeated geometric patterns customary in Portuguese traditional weaving, the works in the exhibition depict figurative out of focus landscapes or interiors conveyed by chaotic stitched movements. 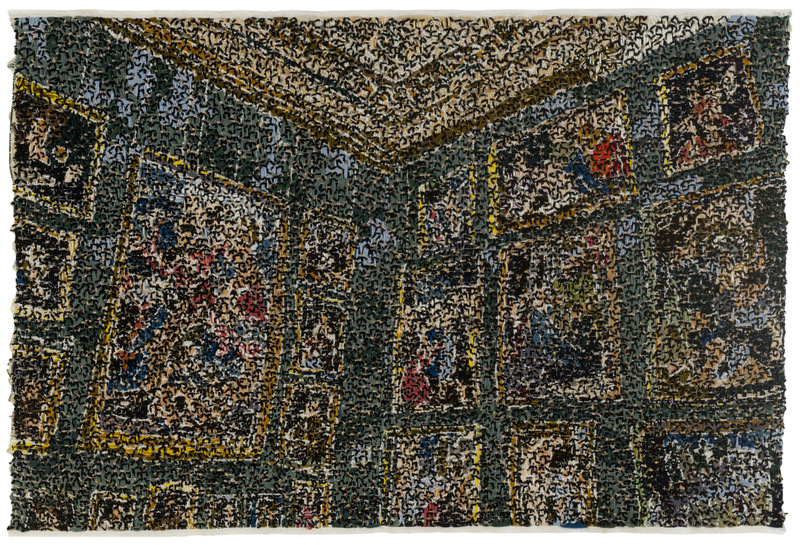 Much like pixelated digital imagery, the visibility is disturbed by the overlapping figures that occupy the works. 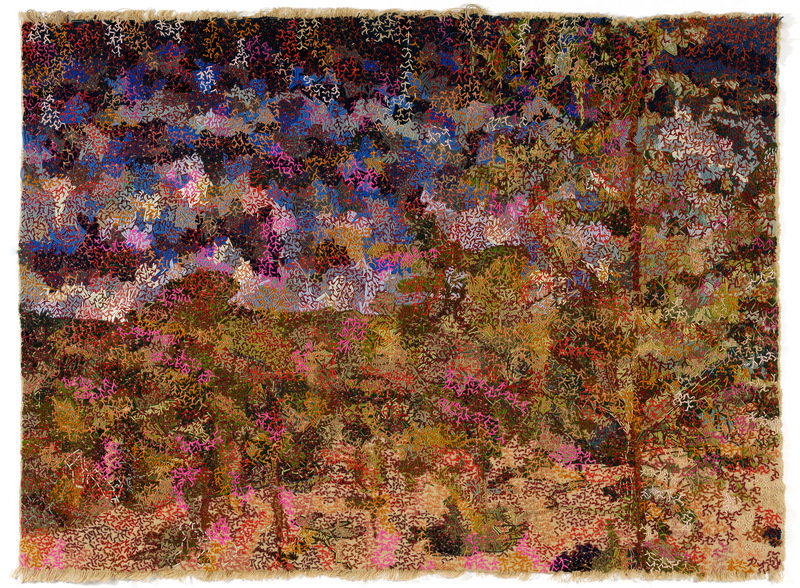 Aggregate of Cork Trees (2018) and Fallen Tree (2016) like his earlier Fertility Landscape (2015) depict wild forest scenes, populated by tiny figures throughout, textured by the wool threads in all directions. As in his previous works, it is a world where the collective human presence is at times overwhelming, but nature persists and dominates. 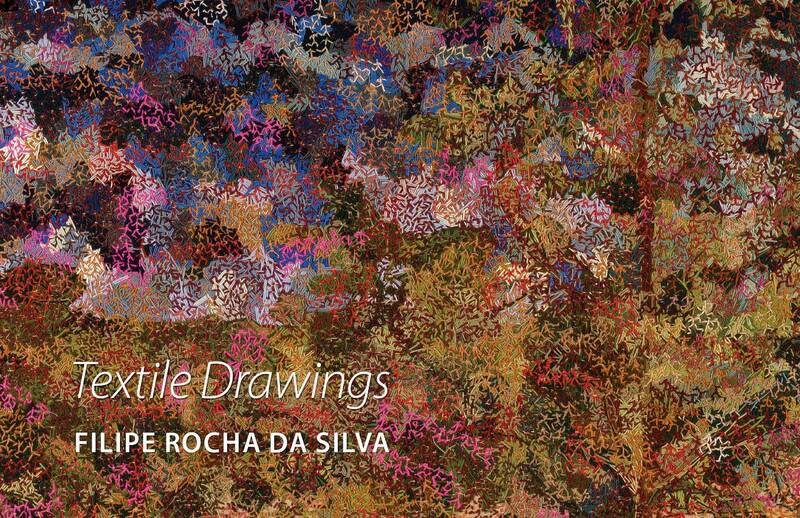 “The chosen landscape scenes do not correspond to classical ideas of a peaceful, idyllic and rural beauty, but display an excessive and chaotic nature, always struggling to fulfill every inch of available space” Rocha da Silva reflects. The exhibition is accompanied by a fully-illustrated catalogue with an essay by Barry Nemett. Filipe Rocha da Silva (b. 1954, Portugal) currently lives and works in Florence, Italy. He completed undergraduate studies in Arts Plastiques et Sciences de l’Art at the Sorbonne, Paris, France (1973), Fine Arts School, Lisbon, Portugal (1980) and Studio Art Centre International, Florence, Italy (1982), earned his MFA at Pratt Institute, New York (1985) and his Ph.D. in Visual Arts at Universidade de Évora, Portugal (2005). 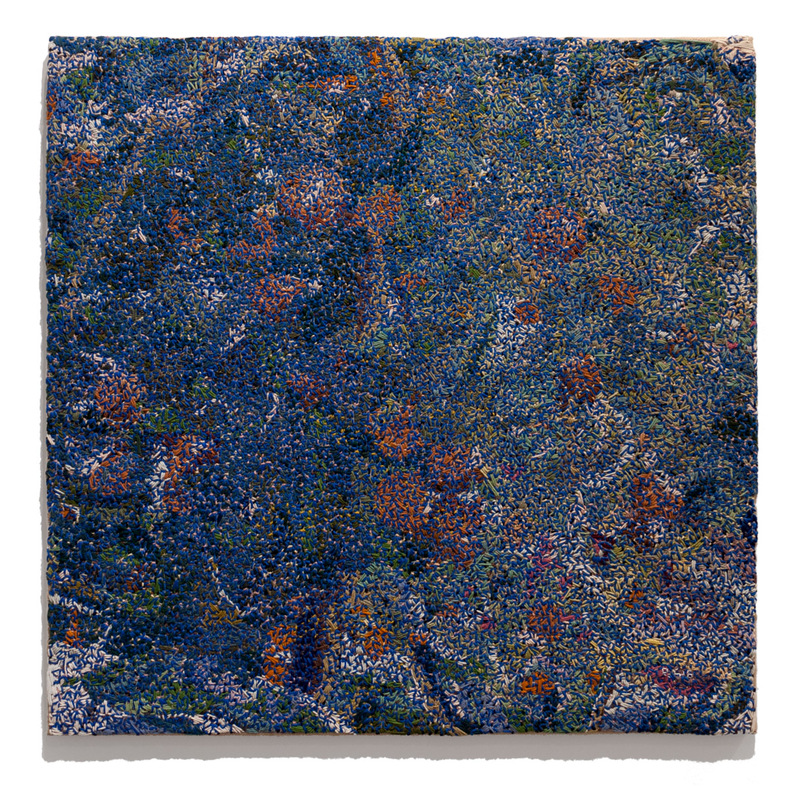 Recent exhibitions include: Blurred Horizons: Contemporary Landscapes, Real and Imagined, Art Projects International, New York (2018); Post Painting, Centro de Artes de Tavira, Portugal (2017); Desenhos Têxteis, Fundação Arpad Szenes Vieira da Silva, Lisbon (2016); Bl, MUTE, Lisbon (2016); and Wool Drawing, Art Projects International, New York (2015). 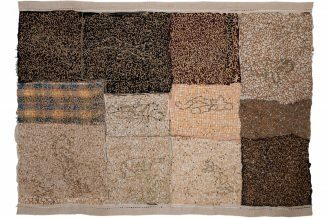 His work is represented in major collections, including Centro de Arte Moderna do Funchal, Madeira, Portugal; Centro de Arte Moderna, Calouste Gulbenkian Foundation, Lisbon, Portugal; Museu da Cidade de Lisboa, Lisbon, Portugal; Museu de Arte Contemporânea, Fundação de Serralves, Porto, Portugal; and Museo de Arte Contemporáneo Unión Fenosa, A Coruña, Spain.